First run in 1976, the Charlottsville 10 Miler is a Charlottsville tradition and the area's oldest and most prestigious race. It starts on the University of Virgina campus, in front of the school's beautiful John Paul Jones Arena, and goes through the town of Charlottsville. Organized by the Charlottsville Track Club, the race has raised tens of thousands of dollars for local charities over the last 40 years. Charlottsville and the surrounding area is steeped in history. Can you say Thomas Jefferson? Charlottsville is not only the home of the University of Virginia, but Monticello, the plantation and residence of Thomas Jefferson, third President of the United States, lies just outside the city. Monticello is now a UNESCO World Heritage Site. Charlottsville, which is 116 miles southwest of Washington, D.C., was also the home of another U.S. President, James Monroe. 1976 - 42 entrants compete in the Charlottesville Track Club’s inaugural Ten Miler.Max and Jenny White(husband and wife) win the inaugural titles on the original Camp Holiday Trails course. The winning time is 59:30. 1977 - The Dogwood Festival includes the 10-Miler in its lineup for the first time. 1978 - The race has 235 entrants. 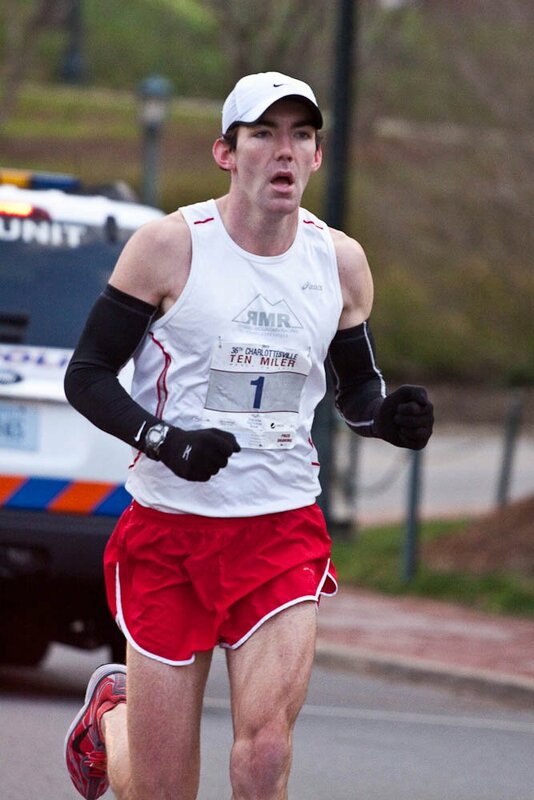 UVA law studentDrew Mearnssets the Holiday Trails course record with a time 50:30. 1979 - Mearns wins his third straight title. 1981 -Cynthia Lorenzonisets the women’s course record (61:05). No woman would run faster on the old Holiday Trails course. 1982 - 390 entrants, the Ten Miler field is 80 percent male and 20 percent female. 1983 - Original race directorsJames and Karen Beaverlead the race for the eighth and final time. 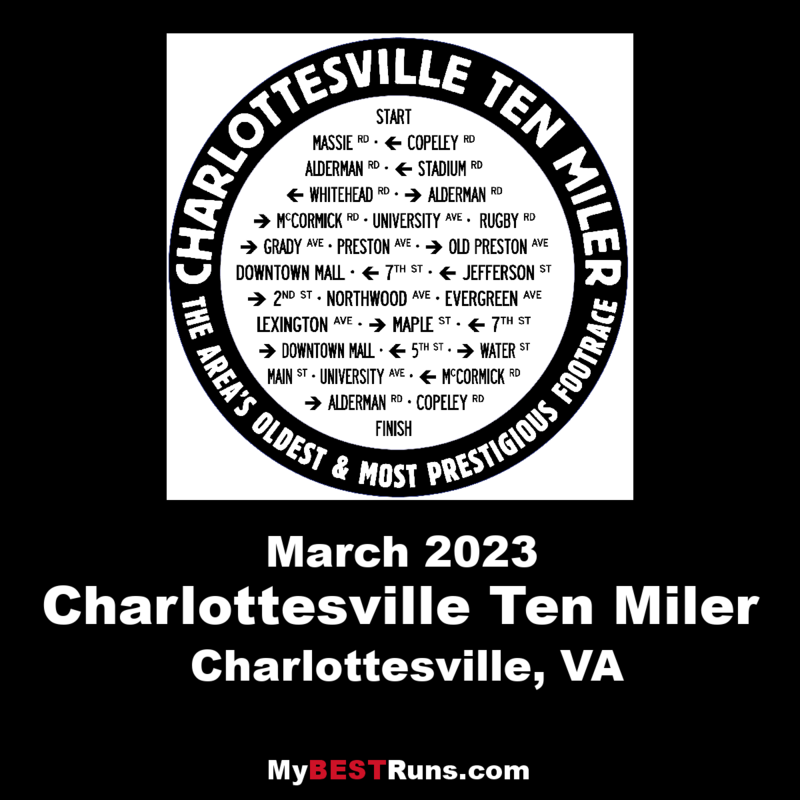 1984 - The Charlottesville Track Club unveils thenew downtown course, having police close roads to auto traffic for the first time in Charlottesville due to a race.Cynthia Lorenzonibecomes the first woman to break 60 minutes, and 16-year-oldCharlie Fredasets an age group record (56:43) that still stands today. (62:58) that still stands today. 1986 -Richard Ferguson, a UVA sports psychology student becomes the first 10-Miler runner to break 50 minutes in capturing his second title. Olympic marathon gold medalistFrank Shorteris a special guest for the races largest-ever field of 694. 1987 -John Bays, 65, andLouise Martin, 70, set age group records that still stand today with times of 77:27 and 99:49 respectively. 1988 - UVA philosophy studentsGordon and Juliette Christiebecome the first husband and wife champions on the new city course. 1989 - The race breaks the 1,000th entrant mark for the first time with 1,415 runners. Olympian and former UVA All-AmericanMargaret Groosruns a record-setting 54:38 and finishes eighth overall, the best finish by a woman in race history. Two men,Ken FrenetteandMike Cotton, break the 50-minute barrier for the first time. 1990 - On the coldest day in race history, three inches of snow fall on racers during 38-degree weather. 1991 - A record 63 people break 60 minutes. 1992 - Now 70,John Bayssets another standing age group record with a time of 84:03. 1993 - Olympic Marathon ChampionJoan Benoit Samuelsonsets the 35-39 age group record with a time of 57:19. 1995 -Mark Lorenzonicalls it a day after 12 years of directing the 10-Miler. 2000 - A record 1,911 runners cross the Ten Miler’s finish line.Jeanne Gaillo, 38, becomes the oldest women’s winner with a time of 63:44. 2002 -Burkhard Spiekermann, 44, places in the top 10 for the fifth time. 2003 - The10-Miler hits 2,000 entrants and donates $20,000 to Blue Ridge Food Bank. 2006 -Dana Coonsis the first female champion under one hour (59:53) since Olympic Marathon champion Joan Benoit Samuelson’s 57:19 victory in 1993.Jeff Eggleston(51:50) runs the fastest men’s time since Travis Walter’s victory in 2000. Eighty- year-oldRev. Wendell Goldenbreaks new ground as the Ten Miler’s only octogenarian finisher (1:55:52). 2007 -Andrea Wright, 45, becomes the oldest winner in the Ten Miler’s history. Her two second victory overEliza O’Connell, 36, represents the closet Ten Miler finish ever.Nancy Fraser, 70, becomes the first women to win outright an entire age group. She defeated both the women and men. 2008 - A record field of 2,525 entrants. 2009 - PACEM is the beneficiary. 2010 - Record number of finishers - 2,342. Blue Ridge Area Food Bank, Emergency Food Bank, and Meals on Wheels are the beneficiaries. 2011 - Camp Holiday Trails is the beneficiary. 2012 - A record amount of money was raised for UVA Lung Cancer Research in honor of past CTC president, long time volunteer, and memberCarol Finch. 2013 - The Senior Center is the beneficiary. 2014 - Barrett Early Learning Center is the beneficiary. 2015 - Monticello Area Community Action Agency (MACAA) is the benficiary. 2016 - SARA is the beneficiary. A long uphill at the start helps to gently and safely lead the racers over a series of rolling hills along Alderman Road. One of the longest and toughest hills peppers the runners as they climb the loop around Scott Stadium. 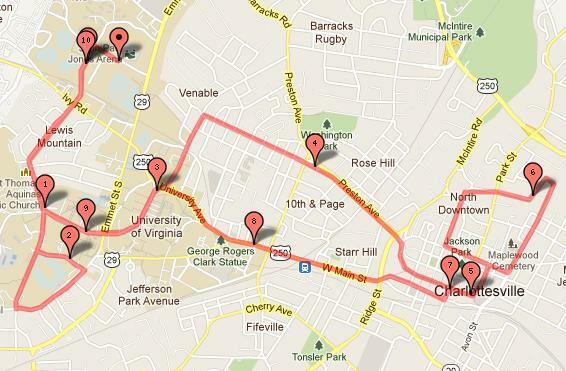 A gentle mile-long rise carries the racers along McCormick Road and through the heart of Jefferson's University to the UVA Chapel and Rotunda. After a slight uphill along Rugby Road, the racers turn onto Grady Avenue and are treated to the longest downhill of the course. The runners continue to get relief as they race down Preston Avenue but as they hit the brick of the Downtown Mall, the racers begin the first of a series of climbs. After a long and gentle downhill through the historic Court Square area and a very steep plunge down scenic Second Street, the racers are hit with a tough climb up Northwood before flattening out along dogwood-lined Evergreen Avenue. The legendary climb up Lexington and Maple is the most talked about section of the course. After their ascent, racers are rewarded with a cruise down Seventh Street, the Downtown Mall and then onto Water Street. Many consider the gentle but seemingly unending uphill straightaway along Main Street to be the most mental portion of the course. After climbing the steep hill along "The Corner," the racers are greeted with a gentle but long and steady downhill back through the beautiful University Grounds. Alderman Road is like a roller coaster of hills but the racers know they're home when they crest the railroad bridge at Copeley Rd.